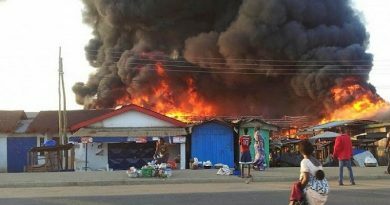 It was another black Saturday at Kosofe area of Mile 12 of Lagos State, as fire gutted over 20 houses and several shops. Scores of the densely populated community were rendered homeless and some, their means of livelihood went up in flame. The incident, which occurred at Adebimpe Street, saw most of the houses built with wood and corrugated iron sheets reduced to ashes. According to an eye witness, the fire started after the stove a woman named Iya Dada was using to cook food caught fire, forcing her to throw it in front of the house where it exploded. Iya Dada, whose husband left the house with their son a few minutes before the incident to buy an item at a nearby shop, was badly burnt by the inferno and she’s currently battling for her life at Gbagada General Hospital.